Digital Fabrication products are important tools in the Aerospace Industrie. 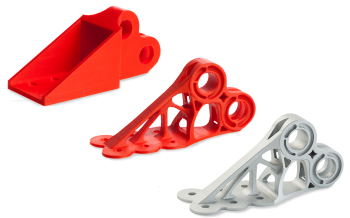 3D-printing is a vital tool for aerospace engineers in rapid prototyping, tooling and even part manufacturing. MakerPoint is a trusted supplier for several Aerospace companies. Review your design with colleagues or customers with a physical product instead of just a CAD file or rendering. Why do Product Design & Engineering customers choose MakerPoint? Each MakerPoint location is fully equipped for maintenance and repair. MakerPoint makes sure you get the most out of your investment!